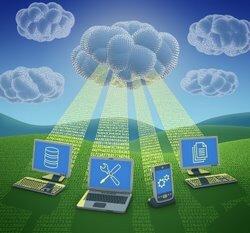 In late 2010 Google grouped its applications for cloud computing use. There are up to 60 applications that can be accessed from any computer in any Internet connected location. Compute from your work desktop, home desktop, laptop, smartphone or tablet with always the latest version documents, current emails etc. The base entry allows up to 50 people to use Google applications for free. More advanced user groups pay a $50 US per person per year fee. Local cost savings can include less desktop software licences, less desktop administration, no need for email server, no need for web server and no need for a file server. Only a browser is required for most applications on any operating system. Google Apps allows for company domain name used on emails and websites. Administrators can control which cloud applications are available for thier organisation's users and departments. Google Docs Documents, spreadsheets, drawings and presentations. Import and export most file types. AdWords Online advertisement on Google and other web sites. Adsense Earn income from website advertisements. Analytics Website performance tracking in detail. Local business opportunities exist in becoming a Google partner and managing data migration and administration to Google Apps.